The second Saturday night at this year's Ottawa Bluesfest featured a full day's worth of hip-hop, as Snoop Lion, Childish Gambino and Deltron 3030 invaded all four of the festival's stages. But for those keen enough to show up early were treated to, hands down, the wildest performance of the evening. 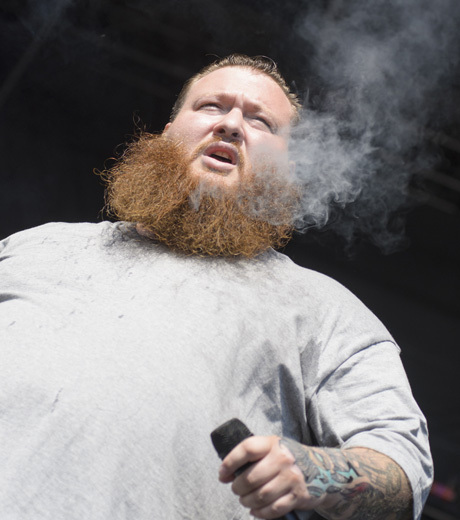 Battling the blazing four p.m. sun, Action Bronson drew a small but ready-to-rock crowd to the festival's co-headlining stage. While the average hip-hop show may open with pre-recorded tracks from artists like Big Freedia and Popcaan, Action Bronson's DJ gave the audience ten minutes of Billy Joel and John Cougar. Sporting a new slicked-back hairdo and Amish length beard, Action Bronson wasted no time busting out the shenanigans, immediately sparking up a joint and coaxing the crowd to chant, "Drugs, drugs, drugs." After a breathless rendition of "Silverado", Bronson jumped onto the front speakers to perform "Pepe Lopez" before descending to the pavement, over the security barrier and behind the stage where he would emerge, microphone in hand, driving one of the festival's golf carts (strangely occupied by members of Deltron 3030). Continuing to spit verses, Bronson drove the cart across the festival grounds before a bewildered and ecstatic crowd began to form around him, causing him to ditch the vehicle. As Bronson made his way back to the stage, stopping to take selfies with festival goers and even disappearing into a port-a-potty, the Queens rapper hardly missed a beat of "It Concerns Me." Returning to the stage to bust out a few more fan favourites, including "Through the Eyes of a G" and "Contemporary Man," Action Bronson abruptly exited after just a 40-minute performance, proving to the crowd that Bam Bam clearly plays by his own rules.